Locating and protecting underground sources of drinking water is a critical part of addressing the long-term drinking water needs of communities across the country. It is an equally important aspect of siting oil and gas injection wells, in order to avoid potential contamination of these water sources. Oil and gas operators who are dependent on the injection of wastewater and other fluids underground must know the location and depth of current or future sources of drinking water in order comply with federal regulations. However, this is not always the case. New research shows that the Oklahoma Corporation Commission (OCC) may have permitted oil and gas wells to inject into potential underground sources of drinking water that are supposed to be protected by federal law and off limits to fossil fuel activities. 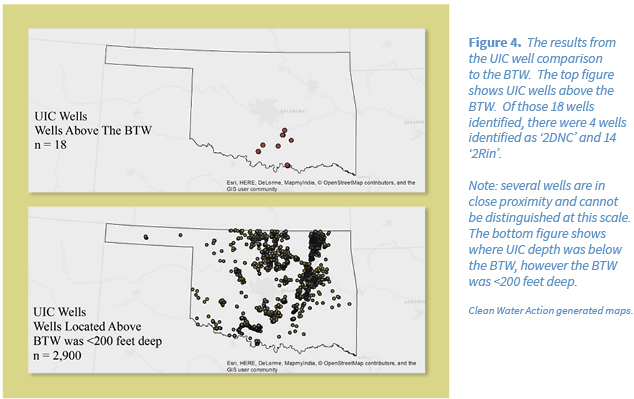 This analysis of injection well locations and water quality data indicates that the OCC may have failed to protect underground sources of drinking water (USDW) from oil and gas injection wells. The OCC uses Base-of-Treatable (BTW) water maps to define where groundwater must be protected as USDW. However, it appears that injection well permitting has not always followed this rule. Our analysis found that 18 oil and gas wells were permitted to inject into depths above the BTW, and do not appear to have received aquifer exemption approval required to authorize injection. If the BTW is accurate at these well sites, then these wells are injecting into groundwater, which could serve as a drinking water source and must be protected by the Safe Drinking Water Act. 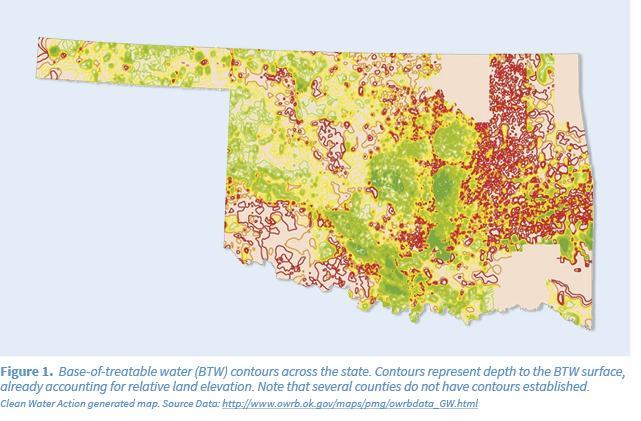 A similar analysis comparing Oklahoma’s BTW water maps to water supply wells, reveals that 6,844 domestic water wells and 175 public water supply wells draw groundwater from below the reported BTW. Since these drinking water wells are extracting useable water, the accuracy of the BTW must be called into question. Taken together, these troubling revelations make it clear that the BTW is not an adequate tool alone to predict location and depth of USDWs and relying on it presents serious complications. Indeed, Oklahoma drinking water in some cases may be at risk from oil and gas injection wells and without a clear understanding of the locations of USDWs, the extent of the issue is unknown. Conduct a transparent review of the full inventory of Class II wells to determine if any additional wells are injecting into USDWs. Immediately halt injection activity at any wells injecting into USDWs without the required aquifer exemption. Review methods for deter- mining USDW location and depth and reevaluate the use of the BTW.